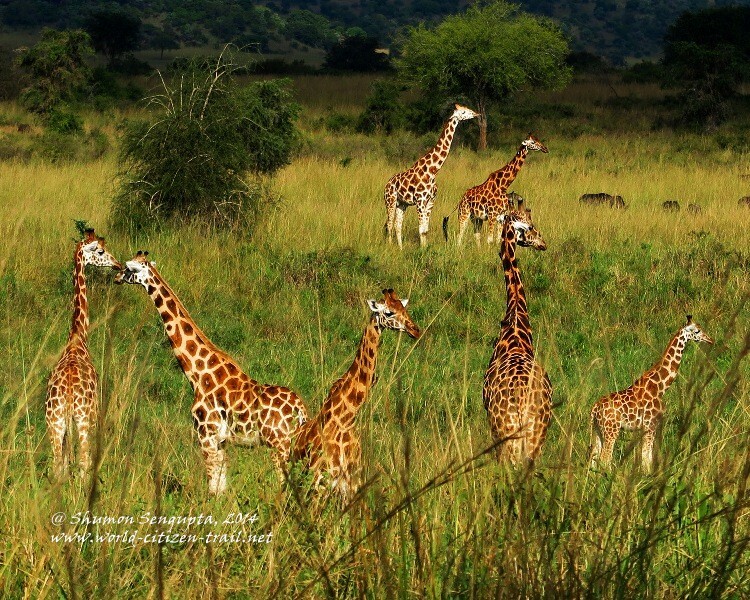 I spent over an hour gazing at a group of 25 Giraffes in the Narus Valley, during an early morning Game Drive, deep into the park. 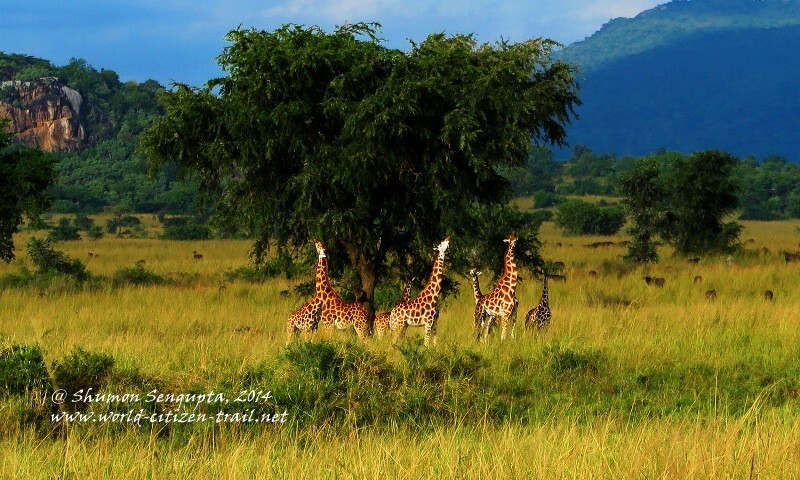 The Narus Valley is a part of the expansive Kidepo Valley National Park in extreme north-east of Uganda, bordering South Sudan and Kenya. 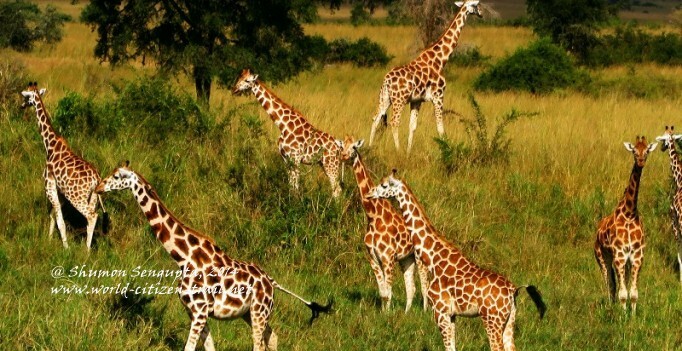 Unlike many busy and touristy national parks of East and Southern Africa, the Kidepo Valley National Park, by the virtue of its remoteness, receives very few visitors. 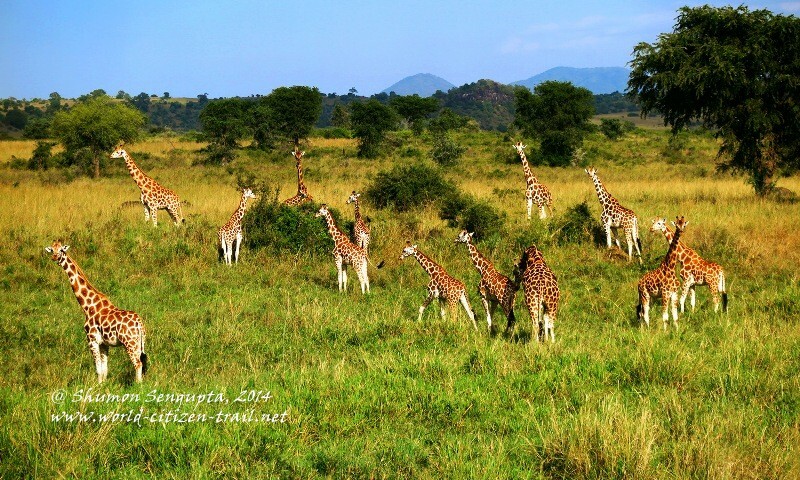 So on this case, it was just me, my personal driver, our guide (an armed forest guard from the Ugandan Wildlife Authority – UWA) our Game driver from the UWA, and needless to say – the stunningly beautiful Giraffes. 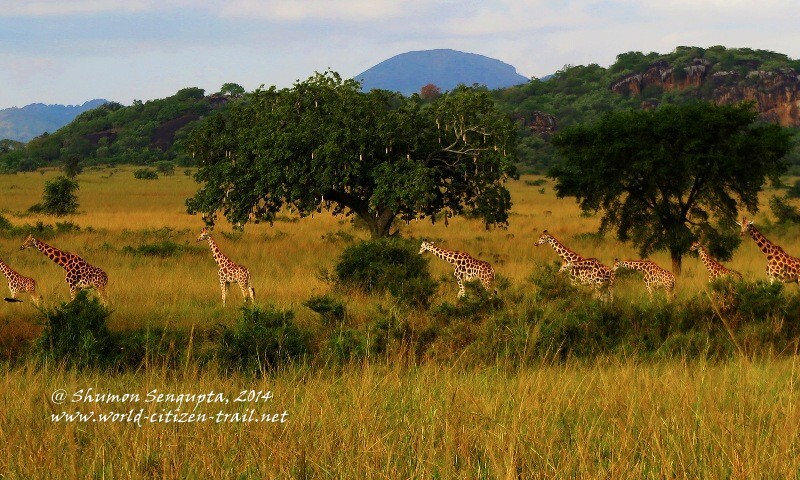 My encounter with these magnificent creatures in the wilderness was thus quite private and intimate. 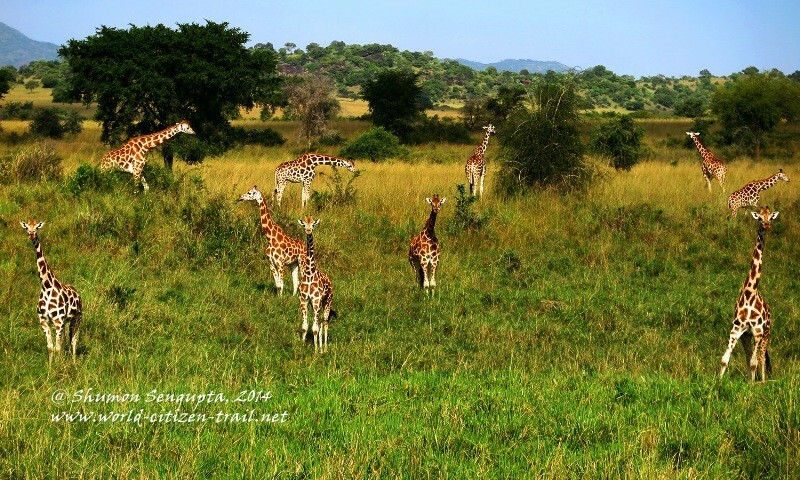 Very interestingly, the scientific name of the Giraffe is ‘Giraffa camelopardalis’, literally meaning ‘Fast-Walking-Camel-Leopard’ ! 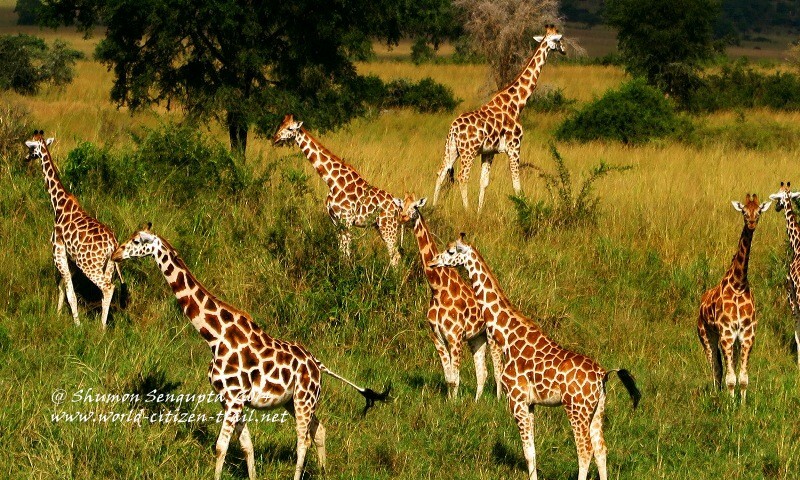 It is the tallest animal in the world and does look like a camel and like a Leopard has spots, albeit much bigger, on its body. 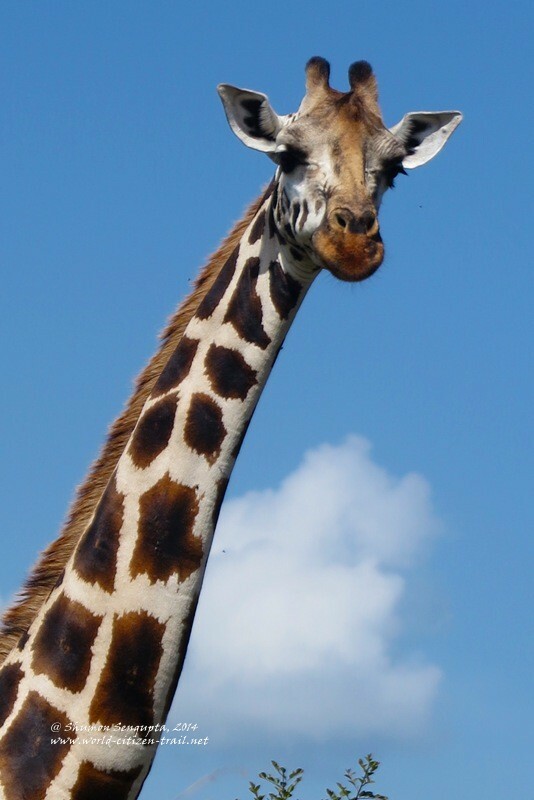 The average height of an adult Giraffe is around 17 feet. 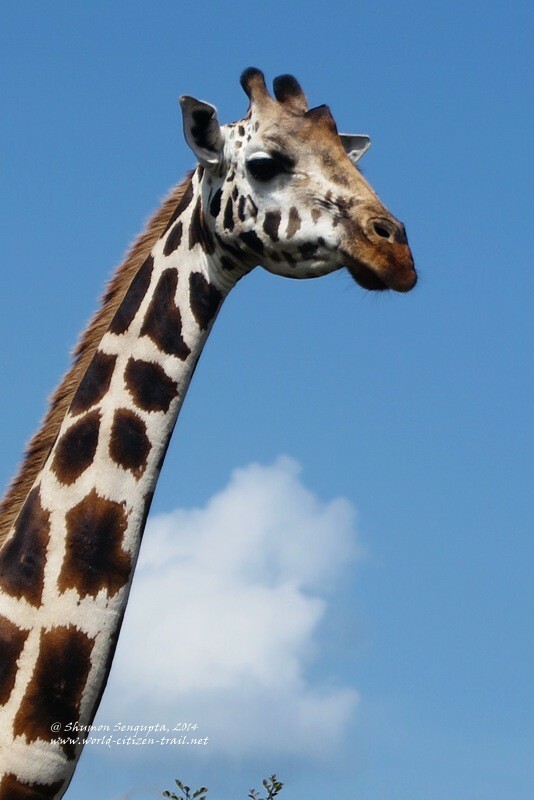 Despite their exceptionally long necks, they have exactly 7 vertebrae in their necks just as all other mammals (except sloths and manatees) do, including humans. 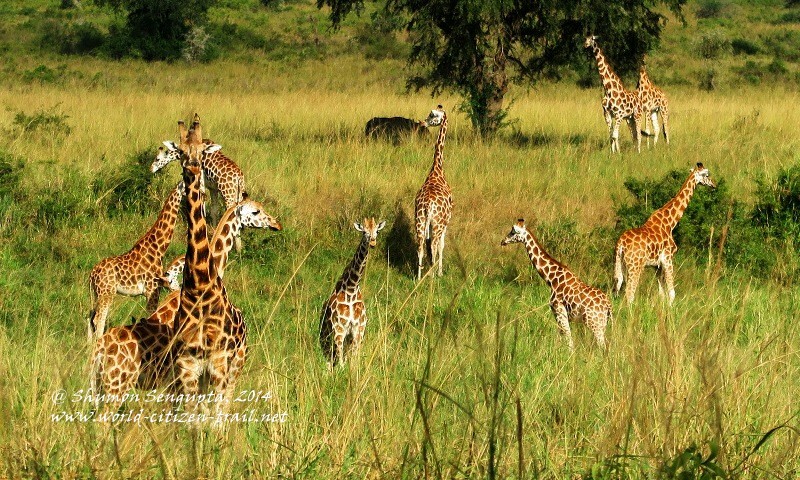 The herd that I came across was an unusually large one, given that Giraffes tend to group loosely in small numbers. 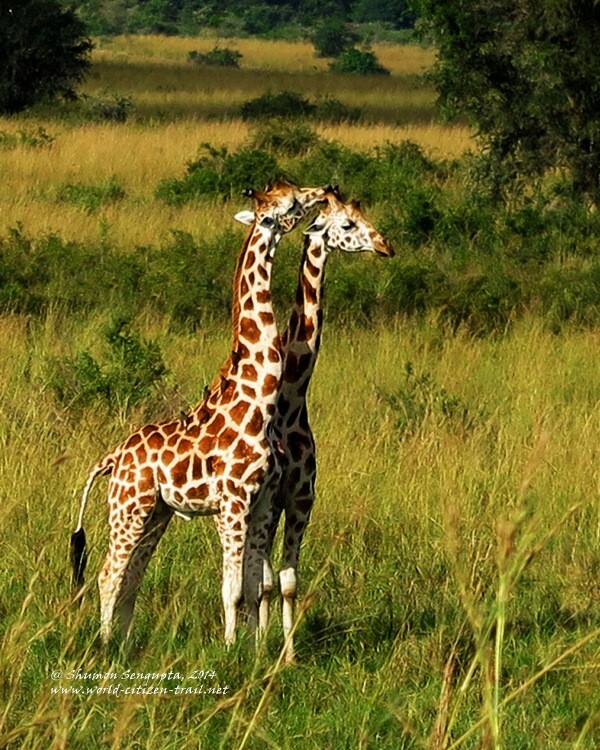 While Giraffes are not necessarily solitary animals, they do tend to be physically and socially pretty aloof – they do not form any lasting bond with each other. The groups are therefore never stable and group composition changes constantly. 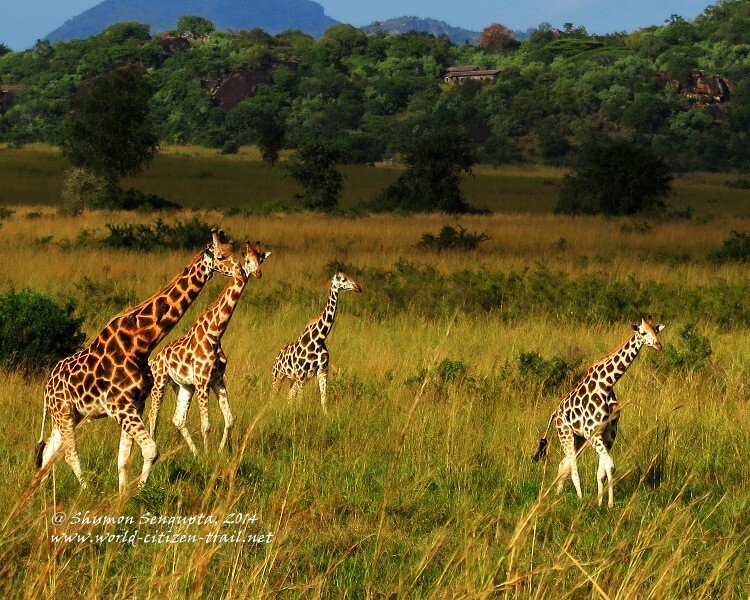 Giraffes don’t have any definitive herd structure and composition’ “variability is the only rule” as Biologist Richard Estes put it. 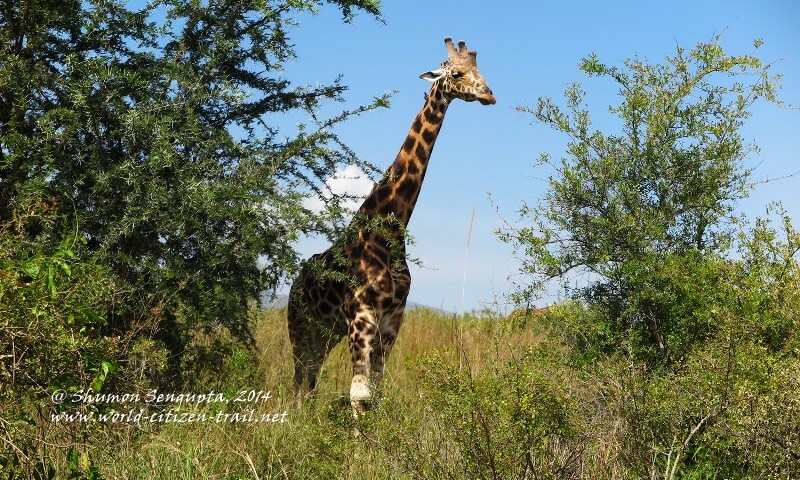 I had learnt that the Giraffe’s vision was very sharp and they could see in color. 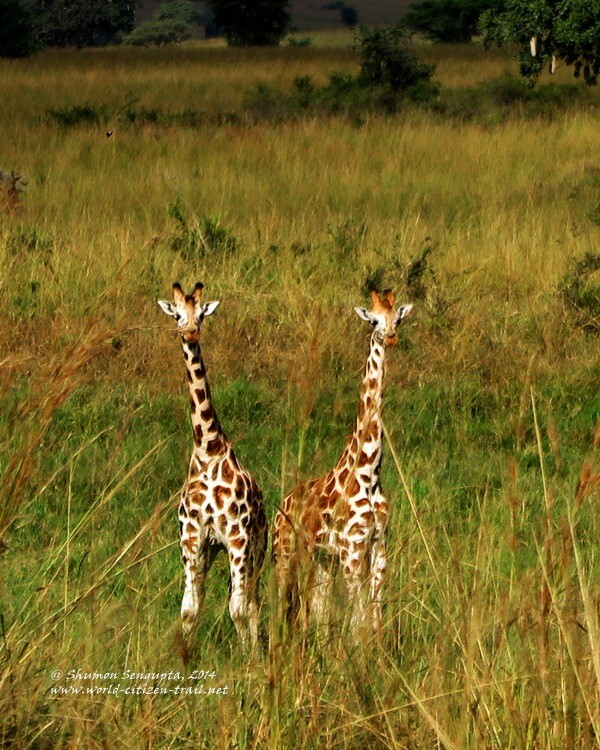 So it was very likely that the Giraffes, with their elongated necks and clear vision, spotted us before we spotted them. 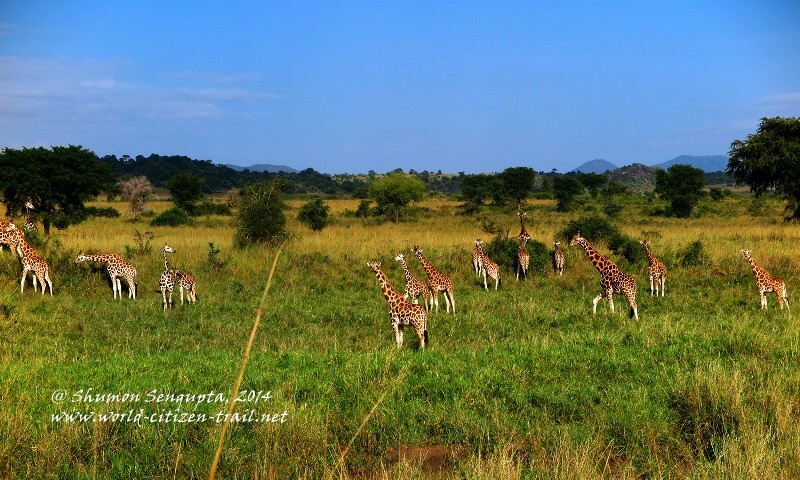 And it was very interesting that many Giraffes, on seeing us, stood on their tracks and continued to gaze at us from their lofty heights through their bulging, dark and sleepy eyes, for almost as long as we stood gazing at them. 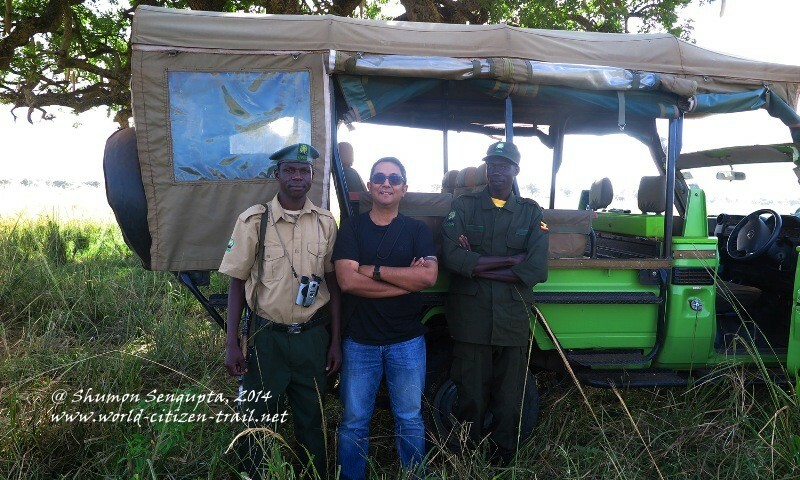 It was as if they were as interested in observing us, as we were in observing them. 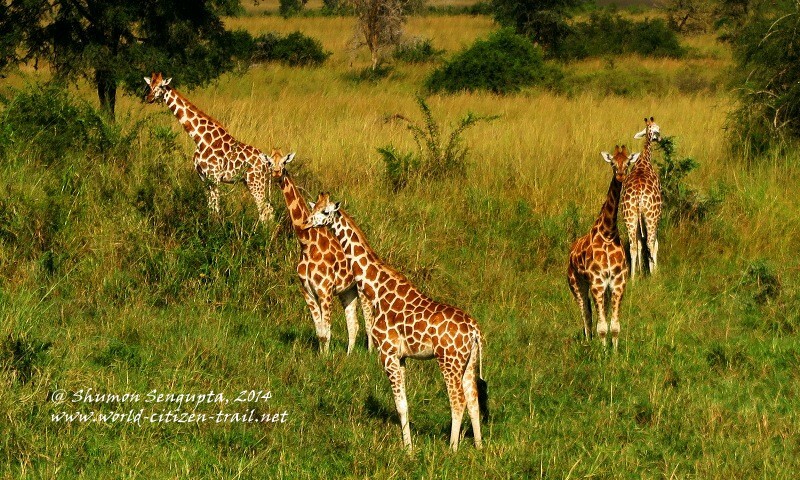 I shall not bore you with fact and figures about Giraffes. These can be easily found in the net. Instead, I shall restrict myself to my observation of their fascinating and exceptionally beautiful physical form and movements. 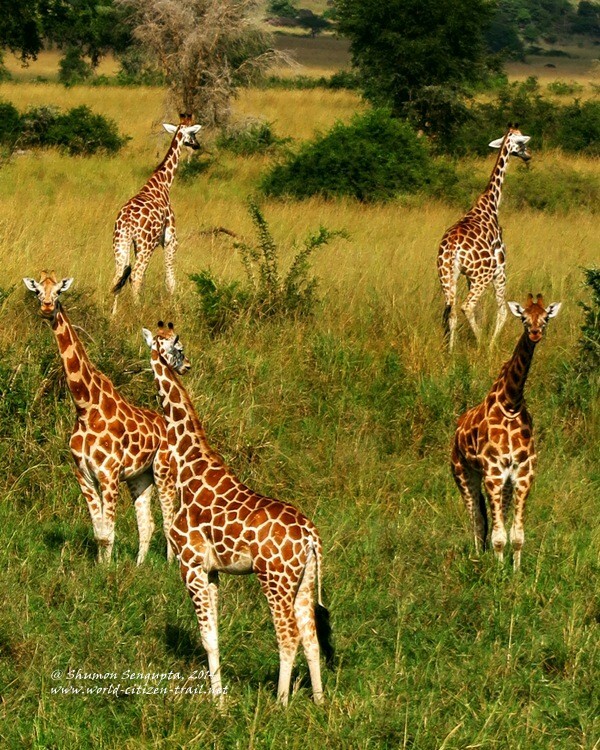 When a Giraffe walks, the two legs on one side move first, followed by the two legs on the other side. 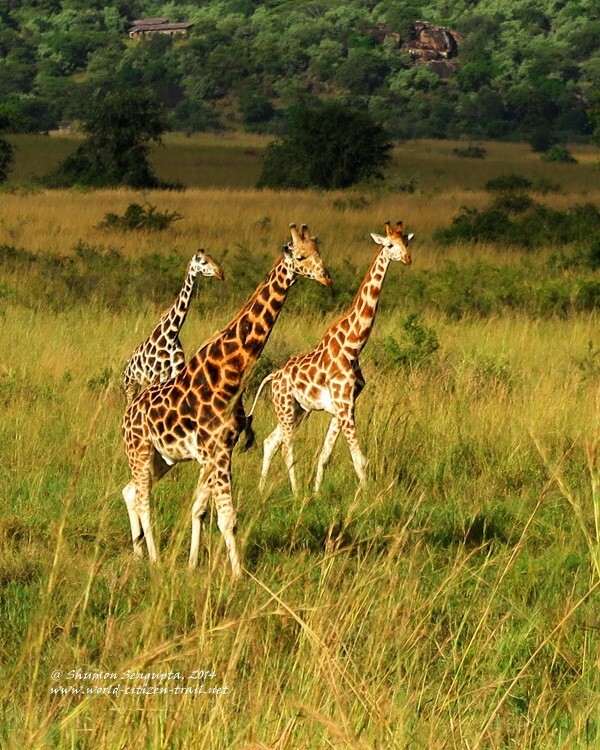 As the Giraffe surges forward, its long neck and body swing to one side, in order to counter-balance the movement of its legs on the opposite side, alternating between the left and the right side. The outline of its entire body seems to constantly undulate and move in a gentle wave like pattern. 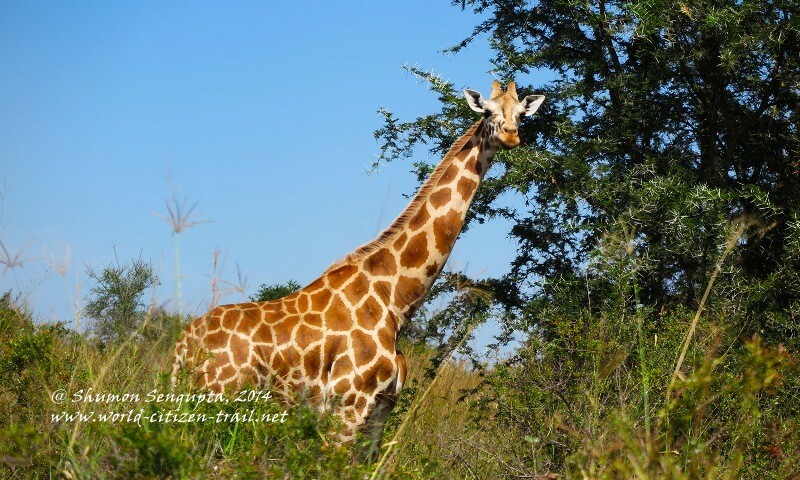 Although an adult Giraffe can weigh over 1,000 kg when they move over the savannah grassland, they seem to almost float, or glide along; there is such an unusual rhythmic and fluid quality to their gait. And it is not just the movements that are beautiful. 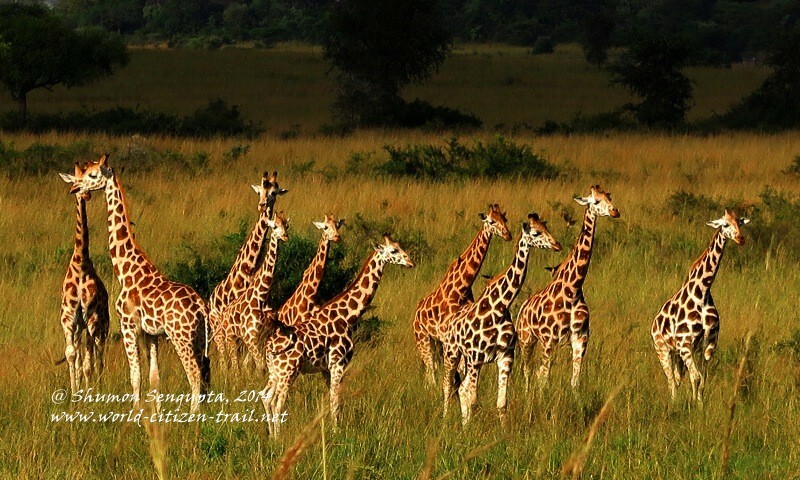 When stationary, the Giraffes seem to also engage in a highly choreographed, graceful and stylized dance, using their long necks as the chief mode of expression. 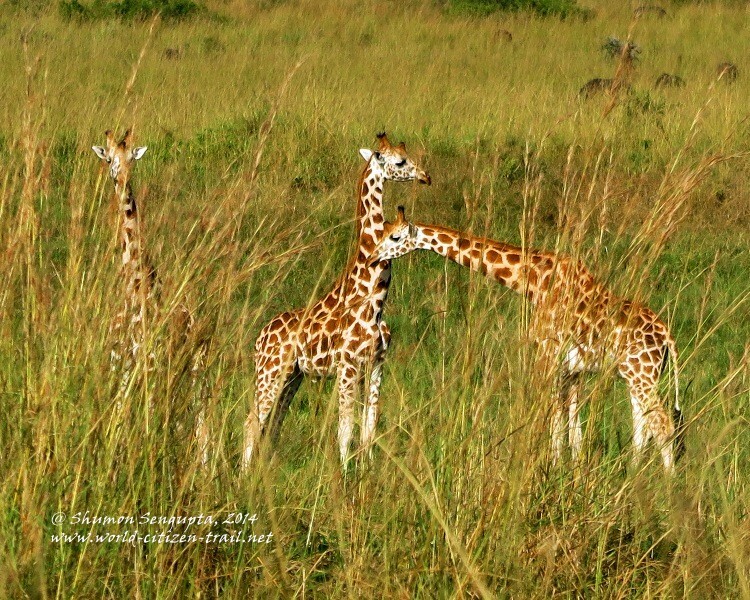 It was absolutely fascinating to see two juvenile Giraffes in particular, engage in what seemed as a ritual dance. 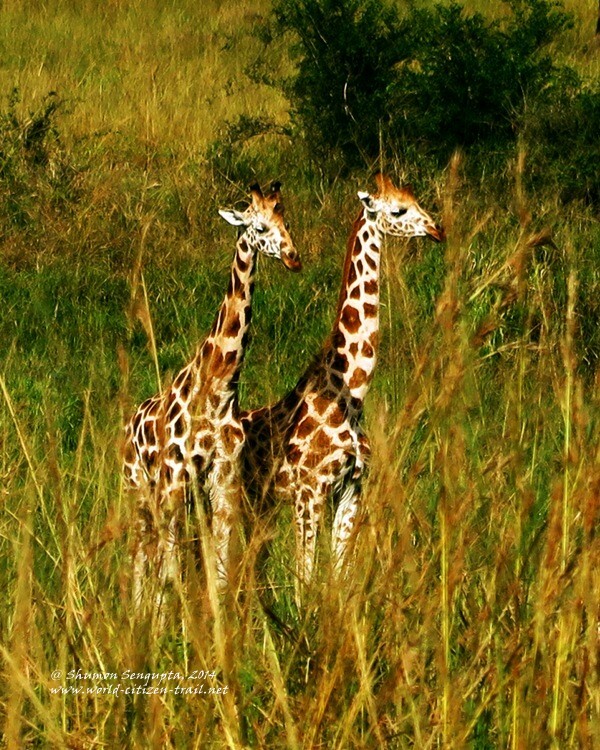 The two Giraffes, straightened their necks, came face to face with each other, then stood close next to each other and then began their dance of swinging their necks alternately and then simultaneously in opposite directions, accompanied with rubbing of necks, flanks and heads against one another, interspersed by mutual grooming. Whatever action one did, the other reciprocated. 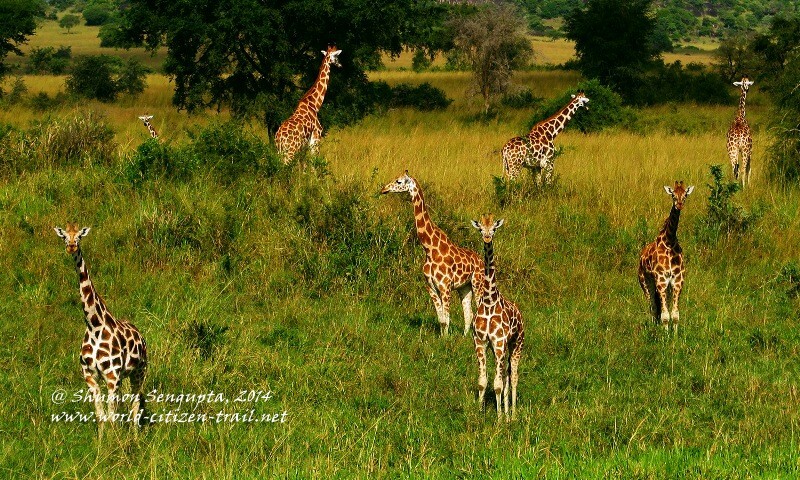 These animals seemed to be inherently capable of grace, rhythm, coordination and synchronization. 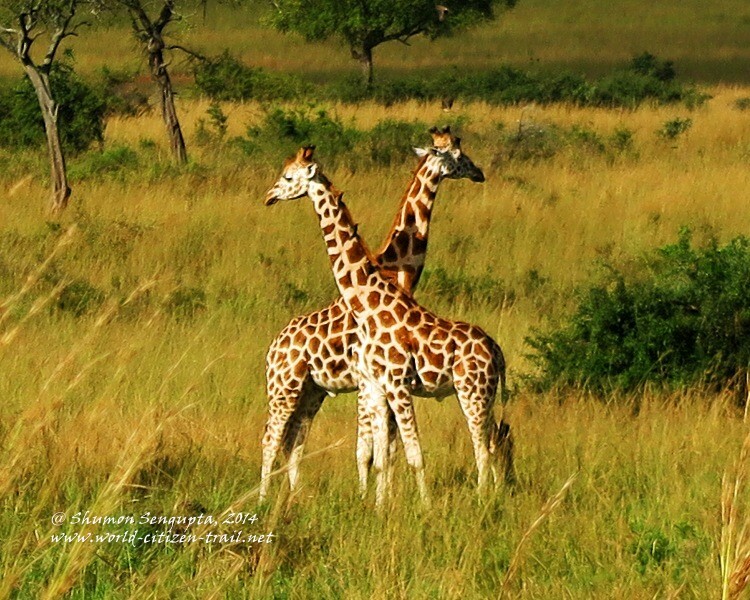 This “necking behavior”, while it can start off as a playful thing, may stop or continue and eventually escalate into a sparring bout (conducted by inflicting blows on each other by the necks) with the aim of proving dominance over the other. Such bouts, however, last only for a few minutes and end when one male clearly establishes its dominance over the other. 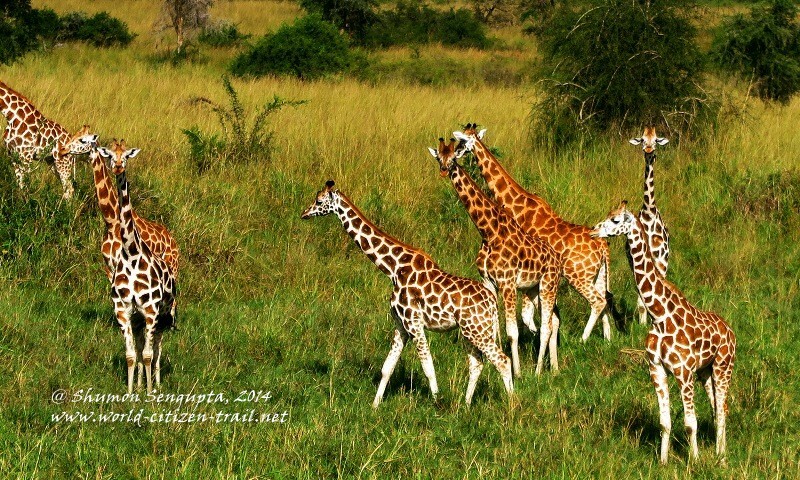 The Giraffes usually don’t get hurt in these necking bouts; before that can happen one of the giraffes simply stops, gives up and wanders off. 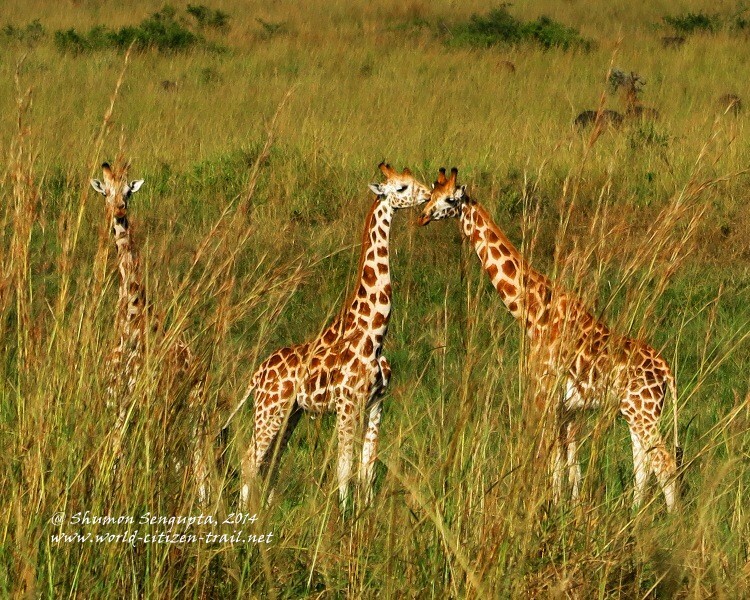 I had always thought that this beautiful “necking behavior” of Giraffes was a mating ritual. I recently learnt that this behavior is engaged in by to rival males, for establishing dominance over the other in terms of mating with the female. 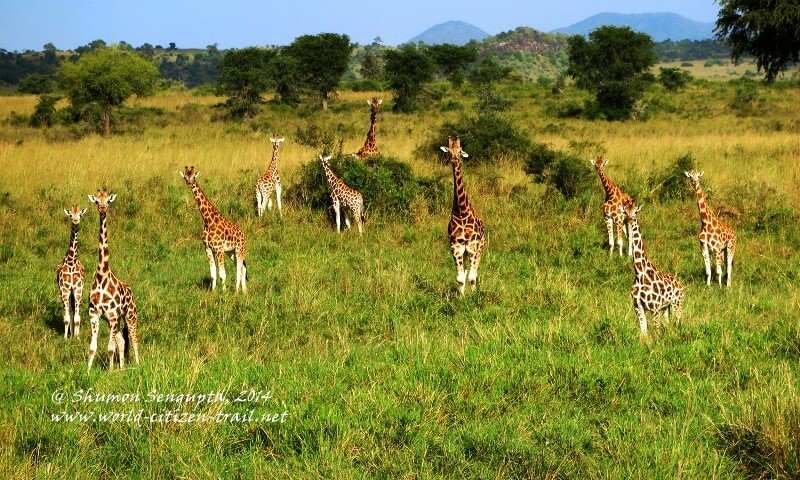 While one may describe the mechanics of the Giraffe’s movements at length and to the minutest details, to me, in summary, the movements and counter movements felt like a work of choreography, unsurpassed in its beauty. 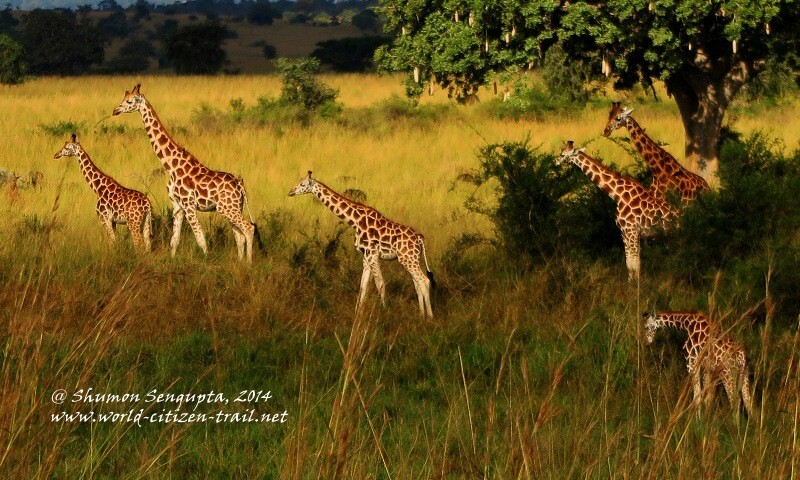 When the Giraffes move in their gentle, graceful and wavy gait, it is sheer poetry in motion. I hadn’t seen such beautiful and elegant movement before. 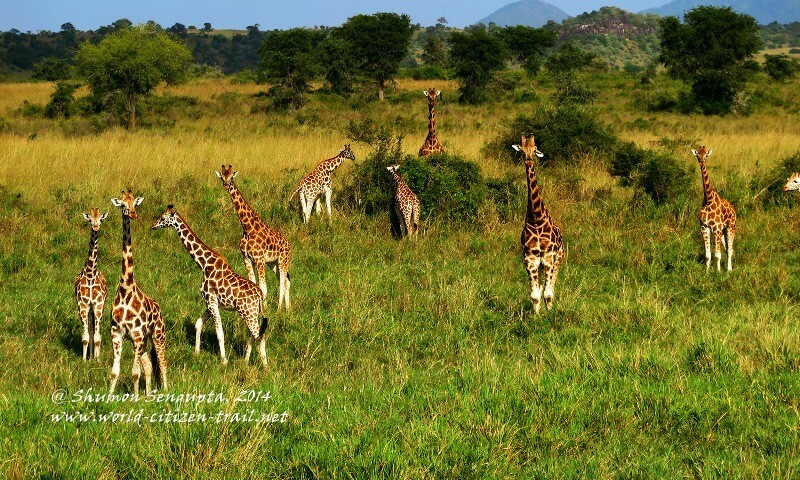 Among themselves, Giraffes are a pretty peaceful lot. When they are not necking, they stay apart and aloof, and seldom come in physical contact with each other. 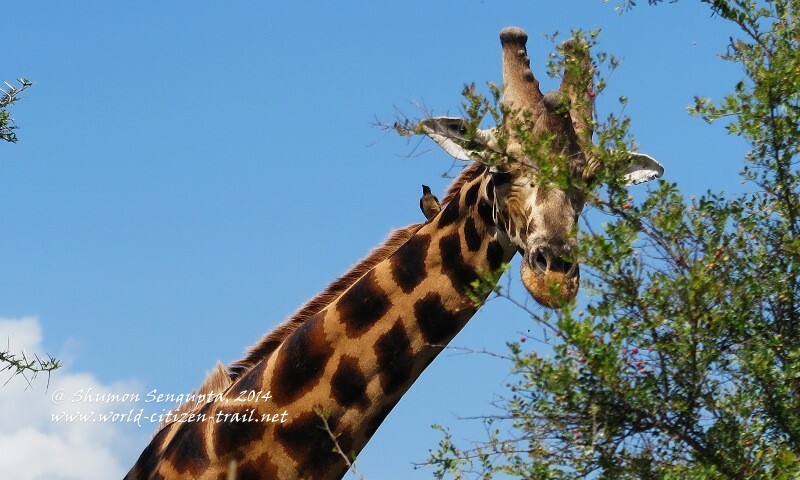 They come close while eating from a same tree though. 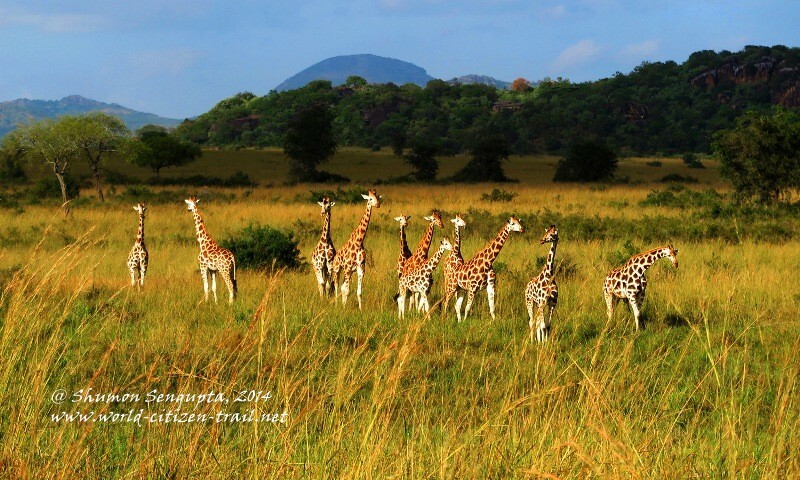 Their grace, beauty, charm and composure apart, Giraffes have formidable strength in their feet. They can easily hurl a lion many feet away, with a single powerful kick, hurting the lion badly in the process. They can even trample a lion to death with the sheer force of their feet. 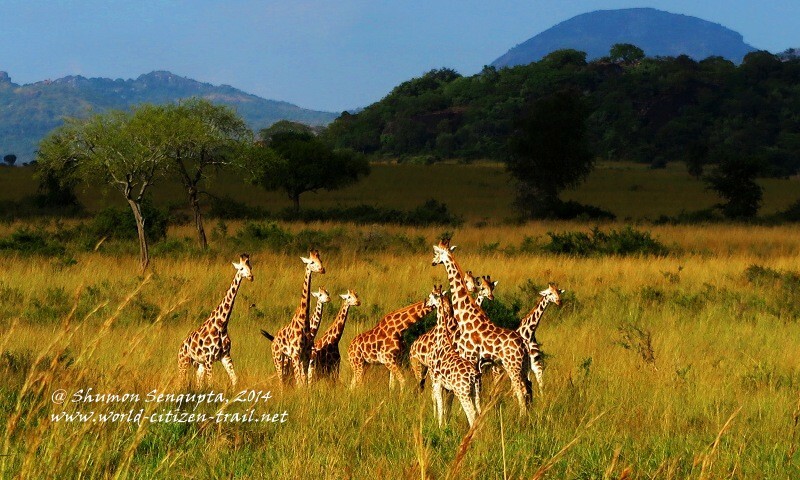 In terms of their physical beauty, apart from their movement, I was amazed to encounter such profound harmony of line and form and the element of design (particularly with respect to the shape of the body, color and the large brown spots) in these animals. I have a very subjective and rather simplistic concept of beauty. When we perceive harmony in line and form, it resonates with something deep and true within us – something primordial within our consciousness. That is when we behold beauty – when we begin to appreciate something as Art. It probably resonates with the fact that there is harmony in the way we breathe, in the way our hearts beat, the way our physical body functions and our emotions swing. 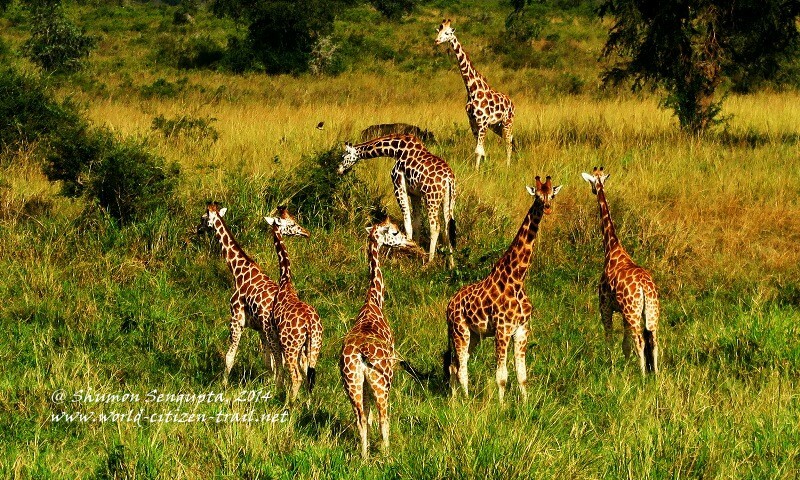 And when we discover this harmony of line and form (and of movement and sound) in nature, as in the case of my group of Giraffes in the Savannah wilderness, we come to behold supreme beauty and begin to wonder at creation itself. Speculation on the ‘Creator’ follows naturally thereafter. Despite my understanding of the theory of natural selection and evolution, despite possessing a rational and scientific temperament, despite knowing that the theory of ”Intelligent Design” is at best pseudo-science, I was led to some deep contemplation on the idea of “The Creator” as the “Supreme Artist”. But that was entirely speculative – the unbridled flight of an idle mind if you like. Enough with my ramble on the philosophy of beauty and aesthetics, of the metaphysics of creation. 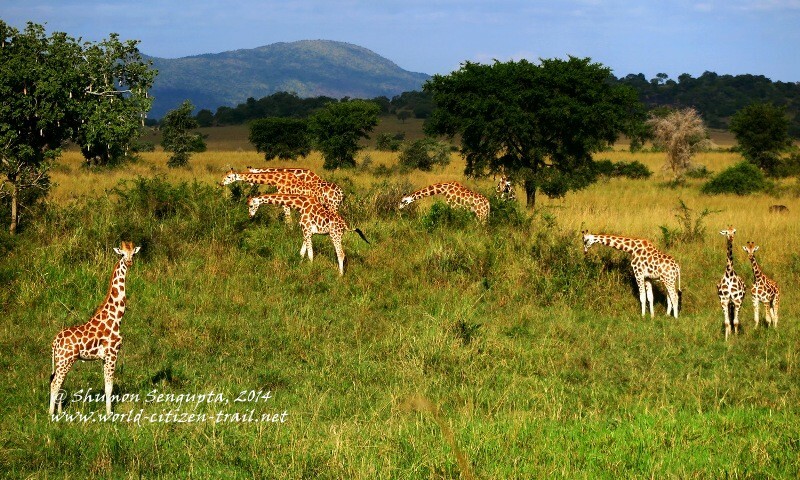 I hope you have enjoyed the n album of photographs I took of these magnificent animals, each a living and moving embodiment of art.